Heroin, formerly the scourge of poor and urban areas has now penetrated middle-to-high income suburban areas with a low cost, high potency product. Fentanyl, with 40–50x the potency of pure heroin is a contributor to the rising death toll. Alarming headlines, combined with growing evidence of death and devastation has led to an outcry for additional legislation, manpower and funding to address substance abuse and dependency disorders. According to Kaiser Family Foundation, prior to the Affordable Care Act (ACA) substance abuse disorder services (inpatient and outpatient services) were not covered by 45 percent of 2013 non-group plans, and mental/behavioral health services (inpatient and outpatient services) were not covered by 38 percent of the non-group plans. Under the ACA, substance abuse treatment was mandated in the essential health benefits, a set of 10 service categories requiring coverage by health insurance plans.5 The ACA also required compliance with the Mental Health Parity and Addiction Equity Act. Prior to the ACA, the Substance Abuse and Mental Health Services Administration (SAMHSA) estimated the distribution of substance abuse spending as follows: 45 percent other state and local, 20 percent Medicaid, 14 percent other Federal, 7 percent private insurance, 6 percent out-of-pocket, 5 percent Medicare and 4 percent other private. Passage of the ACA increased Medicaid and private insurance coverage, the latter based on increased coverage of family members under age 26.6 Healthcare reform is likely to reverse this trend. In recognition of this likelihood, Senate Republicans recently added $45 billion over ten years, $4.5 billion per year, to the proposed Better Care Reconciliation Act of 2017. The incremental state funding is unlikely to cover the possible exclusion of substance abuse coverage from revisions to essential health benefit requirements and the loss of coverage for 22 million Americans. In this article, we provide an overview of the demographics of drug abuse, its etiology and treatment principles; the substance abuse and dependency disorders market, with a focus on specialty substance abuse treatment centers; public policy considerations; and the for-profit, out-of-network business model and diagnostic testing. Rising drug overdose deaths reflect increased severity (and risk) of abuse and not more users. According to federal officials, heroin at a 50–90% pharmaceutical grade is now available at $5.00 a button (0.1 gram lasting one day). 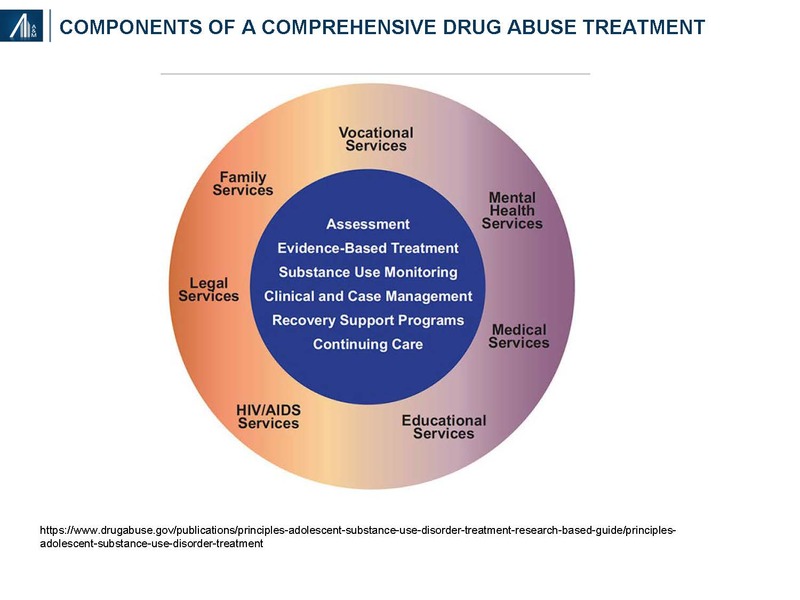 SUD treatment paradigm needs to be individualized, based on the number and types of illicit drugs, co-occurrence of alcohol abuse, presence of co-morbid behavioral health disorders and psycho-social, educational, vocational and other factors. A need for additional evidence-based guidelines exists inclusive of site of service and therapy duration. 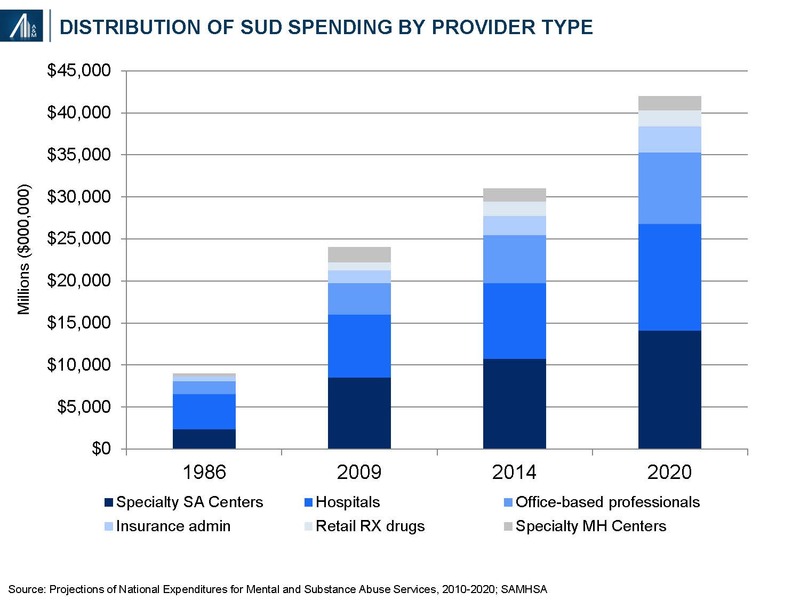 A disproportionate amount of SUD market collections is out-of-network and out-of-pocket. This particularly applies to residential treatment centers and ancillary diagnostic testing. Fraud has become a headline risk for the sector: Medical necessity (“appropriate and essential”); kickbacks; failure to collect co-payments, co-insurance and deductible; bundling of tests and services, etc. Payer scrutiny has dramatically increased, inclusive of such measures as reducing allowable rates, limiting authorization levels across various levels of care, requesting clinical documentation to review for medical necessity of services rendered and increasing audits to validate compliance with collection of patient responsibilities. These policy changes apply to contracted and out-of-network operators. Operating with appropriate compliance and documentation standards, combined with adherence to legal and payer guidelines for collection of patient responsibilities will be required for success going forward. 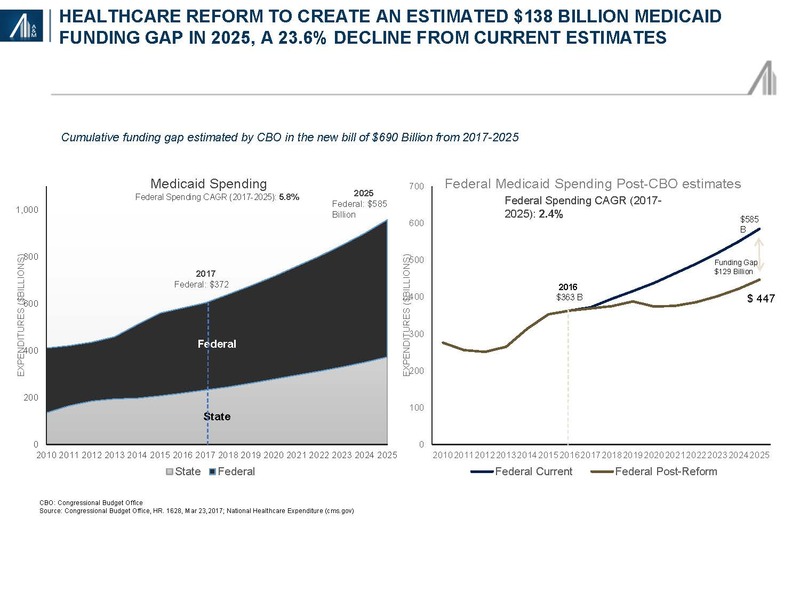 Healthcare reform, as defined by the proposed House and Senate bills, the latter subject to passage and House reconciliation, is likely to reduce federal and state funding support and exacerbate the crisis. A&M believes fundamental business model changes will be forthcoming in the for-profit segment driven by payers, regulators and consumers. It also believes that more, rather than less, support from the federal government is essential as the trail of death and destruction continues to rise. According to the Substance Abuse and Mental Health Services Administration (SAMHSA), 21.6 million Americans have either had a substance abuse disorder, with repeated adverse social consequences or a dependency, with associated physiologic withdrawal. 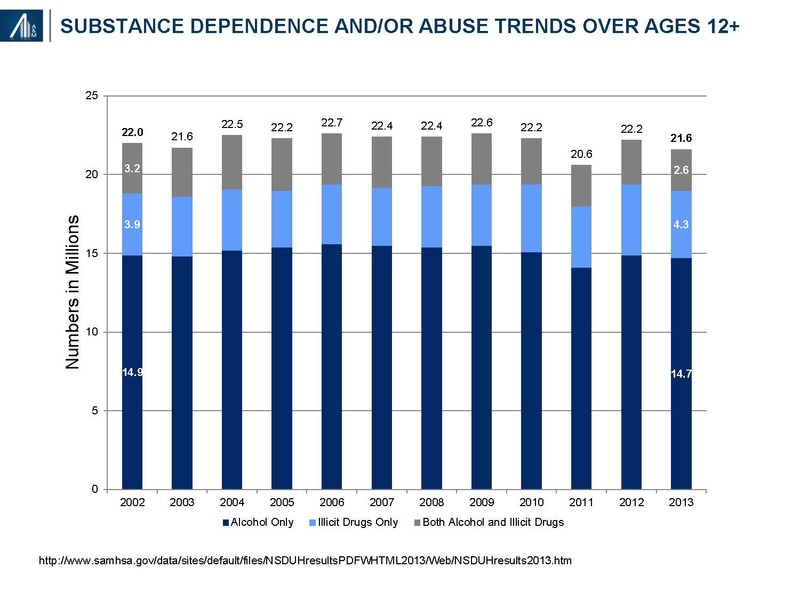 Despite the headlines, the number of substance abuse patients has remained unchanged since 2000. 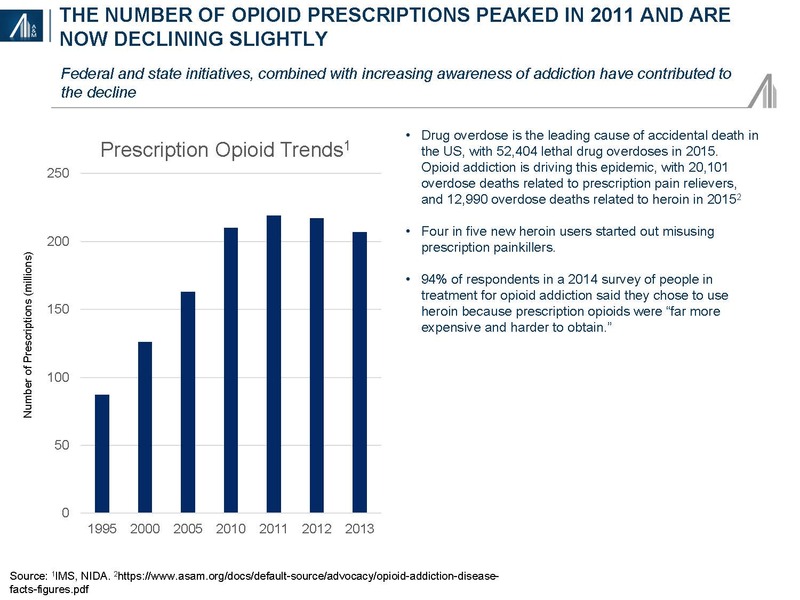 In 2014, there were 43,225 deaths related to prescription (60%) and illicit (40%) drug overdose, more than triple the reported deaths (13, 153) in 1999.9 Opioids account for twice as many as heroin deaths, followed by benzodiazepines (e.g., Xanax, Valium) and cocaine. Emergency Department visits for first-Listed Diagnosis of Substance Related Disorders (CCS 661) increased from 404,643 in 2006 to 656,388 in 2013, an increase of 62%.10 The rise in ED visits also reflects the acuity of the underlying abuse disorder. An analysis of the data suggests that the majority of visitors are male (60%), relatively young (18–44: 67%, 45–64: 24%) and either uninsured (31%) or on Medicaid (29%); private payers account for 20% of the total, followed by Medicare at 15%. Other substances of abuse include alcohol (16.6M), cocaine (855k), stimulants (469k), tranquilizers (423k) and hallucinogens (277k). Combined alcohol and drug use, as well as poly-pharmacy, among drug abusers are common. Marijuana is used by 4.2M people and is considered legal for medical purposes in 18 states and for recreational use in four. 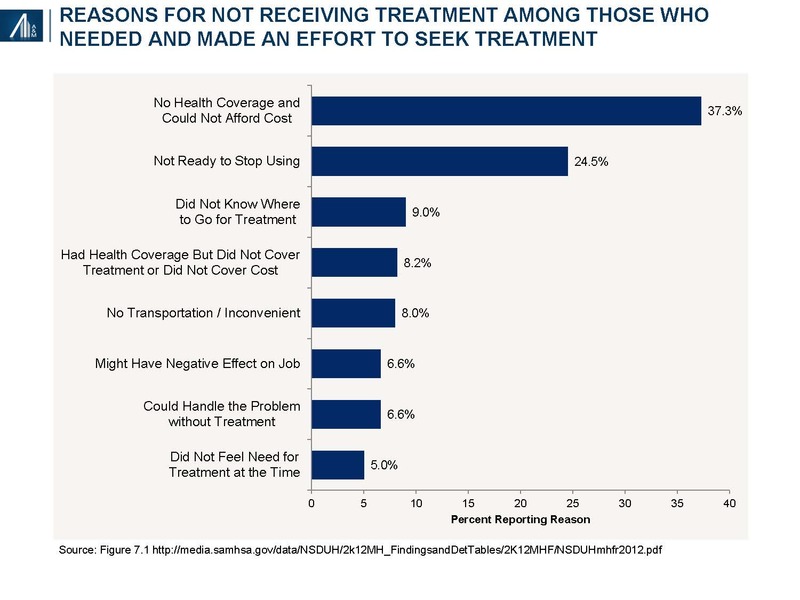 Among the reasons for not receiving treatment cited from 2010 to 2013 includes lack of coverage, cost and access—barriers subsequently affected by the Patient Protection and Affordable Care Act (PPACA) and the Mental Health Parity and Addiction Equity Act (MHPAEA) of 2008. The number of uninsured 18–64-year-olds has declined from 40.3 million in 2012 to 25.3 million in September 2015, a decline of 37.2%.16 Assuming a 3.0% prevalence rate of illicit drug use (+ / - alcohol) and 9.2% of alcohol abuse (+ / - illicit drugs) implies an incremental 450,000 to 1.4 million SUD patients receiving insurance coverage. Applies to plans sponsored by private and public sector employers with more than 50 employees, including self-insured as well as fully insured arrangements; and health insurance issuers who sell coverage to employers with more than 50 employees. Requires group health plans and health insurance issuers to ensure that financial requirements (such as co-pays, deductibles) and treatment limitations (such as visit limits) applicable to mental health or substance use disorder (MH/SUD) benefits are no more restrictive than the predominant requirements or limitations applied to substantially all medical / surgical benefits. 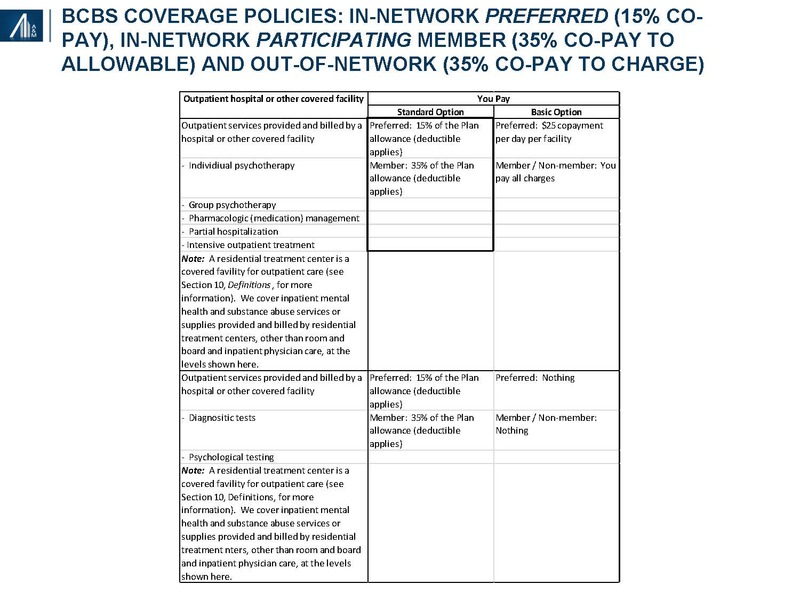 If a plan or issuer that offers medical / surgical benefits on an out-of-network basis also offers MH / SUD benefits, it must offer the MH / SUD benefits on an out-of-network basis, as well. Although MHPAEA provides significant new protections to participants in group health plans, it is important to note that MHPAEA does not mandate that a plan provide MH / SUD benefits. Rather, if a plan provides medical / surgical and MH / SUD benefits, it must comply with the MHPAEA’s parity provisions. 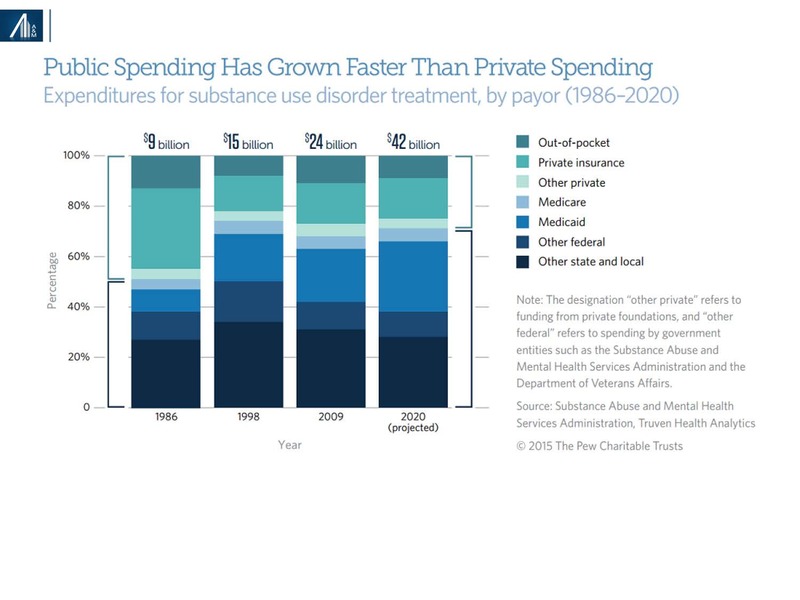 The direct cost of substance abuse treatment (2014: $31 billion), is dwarfed by the indirect costs (2011: $193billion) driven by lost productivity ($120billion), crime ($61billion) and non-homicide and other health costs ($12billion).23 The indirect cost figure does not include the cost of family disintegration, domestic violence or child abuse. Understanding the profile of SUD patients could explain the chronicity and high indirect costs. 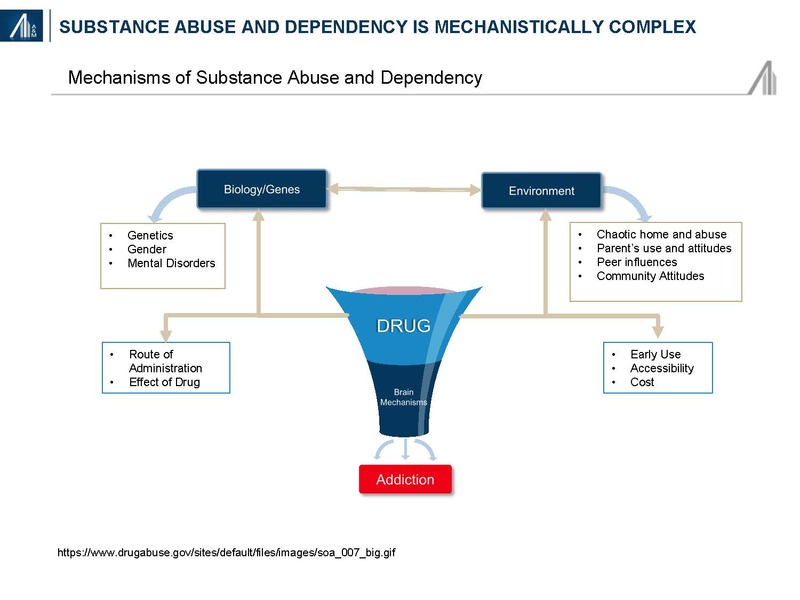 Mechanistically, substance abuse and dependency disorders have multiple risk factors including genetics, the environment and actual changes to the brain structure and function. SUD treatment is multi-dimensional incorporating specific efforts to stop using drugs, maintain a drug-free lifestyle, and achieve productive functioning in the family, at work, and in society. A litany of mental health, medical, educational, social, legal, psychosocial and vocational needs require consideration. Treatment must also be appropriate for age, race, ethnicity and gender. 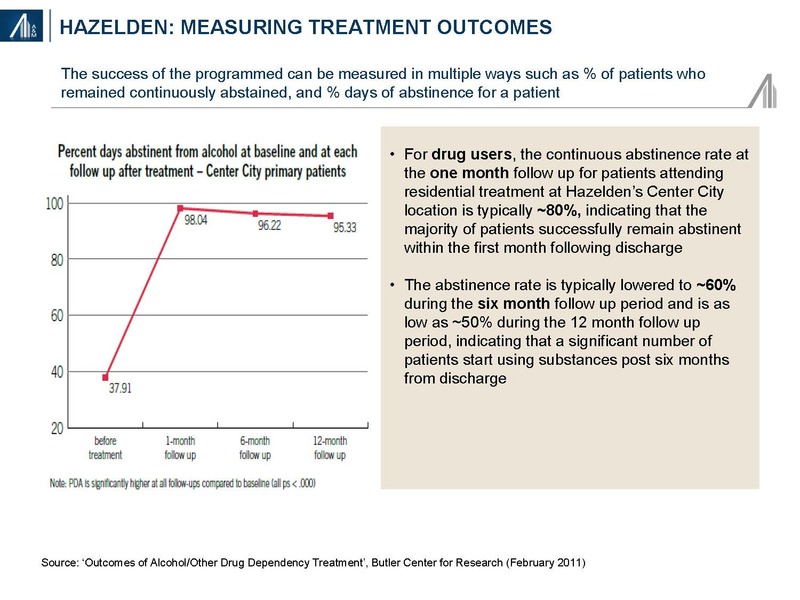 According to the National Institute on Drug Abuse (NIDA), participation in residential or outpatient treatment for less than 90 days is of limited effectiveness, whereas for methadone maintenance, a minimum of 12 months is required to become effective.29 Recovery is a long-term process subject to periodic relapse that may necessitate several residential stays. 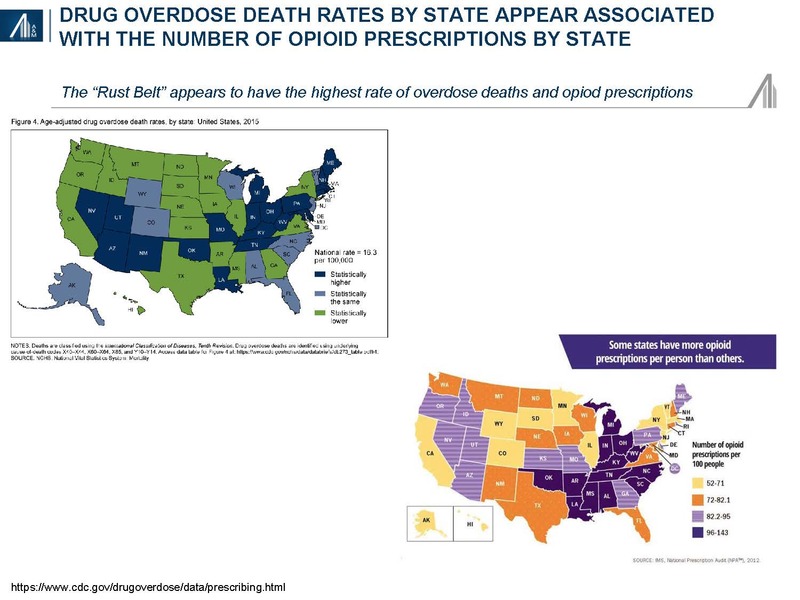 Some 2.0 million Americans suffer from prescription opioid abuse or dependency; another 4.3 million adolescents and adults have reported nonmedical use of prescription opioids.31 The impact of the opioid epidemic varies by state. 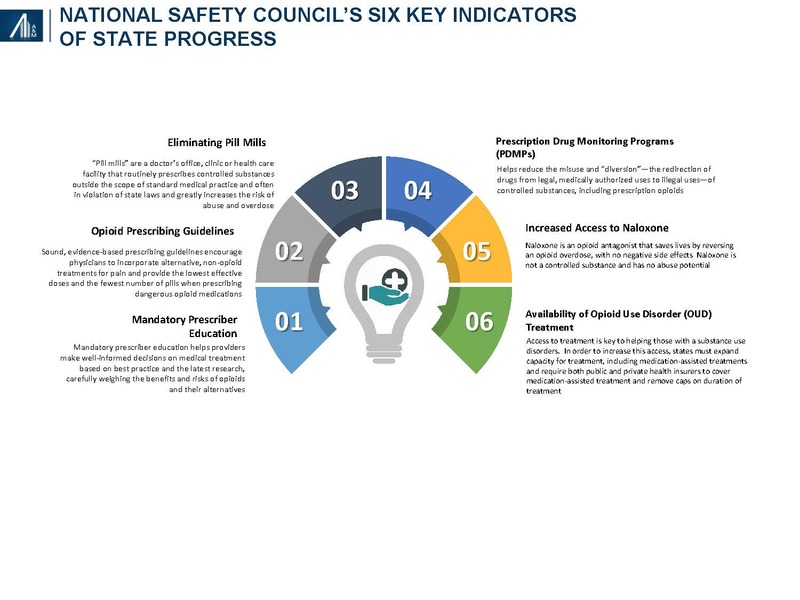 The National Safety Council examined six key indicators of progress, including mandatory prescriber education, opioid prescribing guidelines, eliminating pill mills, prescription drug monitoring programs (PDMPs), increased access to Naloxone and the availability of opioid use disorder (OUD) treatment. Prescriptions are declining, albeit slowly. Florida, formerly branded as the "pill mill capital" of the U.S., has significantly reduced the number of prescriptions from the state's top opioid prescribers since the implementation of legislation in 2015.32 PDMPs have been relatively ineffectual since implementation in 2002, although the recent availability of interoperable clinical data may increase its effectiveness. Funding estimates by the Pew Charitable Trust from 2015 are already in jeopardy. The House and proposed Senate healthcare reform bills would significantly reduce the funding available through Medicaid and elsewhere. The substance abuse and dependency market approximated $31 billion in 2014, and is forecast to reach $42 billion, +35% in 2020, reflecting a 5.2% compound annual growth rate (CAGR).34 The market is divided into six segments, the largest being specialty substance abuse centers, hospitals (primarily involved in short stay detoxification) and office-based professionals. Retail (non-hospital) drugs are primarily used to treat co-morbid behavioral health issues and heroin addiction, known for severe drug carvings. Other professional services: care provided in locations operated by independent health practitioners other than physicians and dentists, such as psychologists, social workers and counselors. Physician services: independently billed services provided by Doctors of Medicine (M.D.) and Doctors of Osteopathy (D.O. ), plus the independently-billed portion of medical laboratory services. Specialty MH centers: organizations providing outpatient and / or residential mental health services and / or co-occurring mental health and substance abuse treatment services to individuals with mental illness or with co-occurring mental illness and substance use diagnoses. Specialty SA centers: organizations providing residential and / or outpatient substance abuse services to individuals with substance use diagnoses. 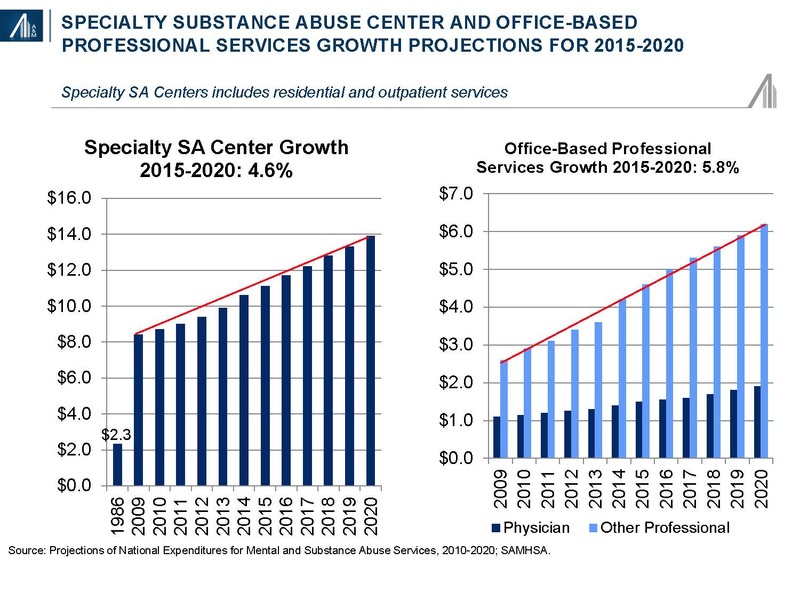 Strong growth is projected for specialty substance abuse centers and office-based professional services due to the rising demand associated with increased coverage and rising severity of addiction. Approximately two-thirds of institutions participating in SAMSHA’s annual survey are either not-for-profit or government-led entities; the remaining one-third is for-profit. 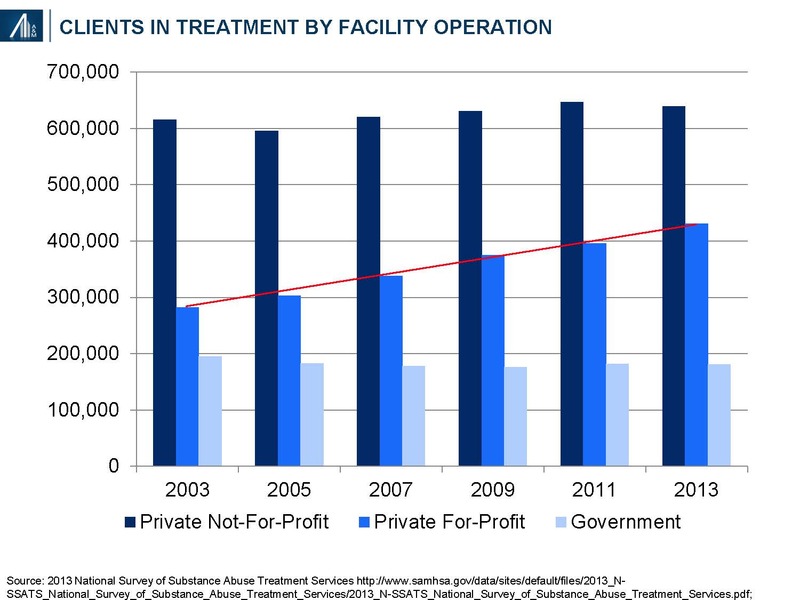 The number of for-profit facilities has increased from 3,403 (25.0% of total) in 2003 to 4,574+34% (32.3% of total) in 2013. During this period, the number of clients in for-profit outpatient and residential SUD treatment increased from 282,161 (25.8% of total) to 430,362, +53% (34.4% of total). Data is available on 103,776 (96.3%) of the 107,727 designated beds in SUD treatment centers during the late-March SAMHSA survey period: 78,754 are in private not-for-profit facilities (75.9%), 15,712 in private for-profit facilities (15.1%) and 9,310 in government facilities (9.0%).35 The number of beds per SUD residential treatment facility for private not-for-profit (30.4), private for-profit (30.5) and government facilities (27.0) are similar. 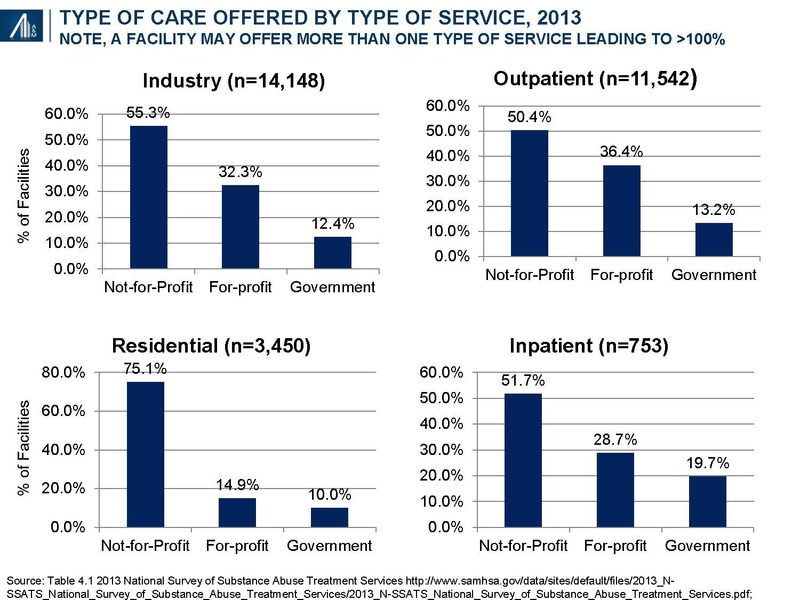 For-profit entities tend to be over-represented (relative to the overall industry average) in outpatient facilities (91.8%) and under-represented in residential facilities (11.3%). 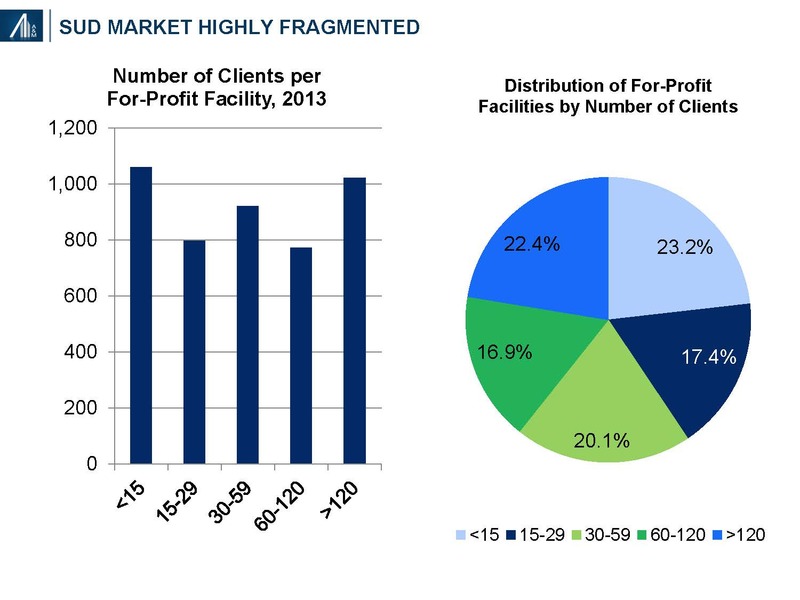 The private for-profit SUD market remains highly fragmented, with 60.7% of facilities having fewer than 60 clients per year. The distribution of not-for-profit facilities is somewhat similar.36 The largest for-profit provider, Acadia CRC Health, established in 2005 and publicly-traded, has 216 U.S. facilities; the number of residential SUD centers remains unknown. Private payers account for 29% of total spending—out-of-pocket (9%), commercial (16%), other (4%)—whereas, public payers account for 71%—Medicaid (28%), other state and local (28%), federal programs (10%) and Medicare (5%). An analysis of Emergency Department payer mix based on insurance status (not spending) suggests a payer distribution led by Medicaid (29%) and the uninsured (31%), followed by private pay (20%), Medicare (15%) and other (4%).37 It’s not inconceivable that 24% of patients (private pay, other) account for 29% (or higher) of total SUD market spending. Commercial payers, historically willing to pay for a broad range of in-network and out-of-network services, are increasing their scrutiny of the approach to treatment, specific service offerings, site and duration of service and payment model. Approaches to treatment are complex given the multitude of illicit drugs, potential for concomitant alcohol abuse, co-morbid behavioral disorders, range of social, vocational and legal issues, and the possibility of HepC, HIV and other transmittable diseases. Scientific evidence beyond anecdotal and expert opinions, and perhaps, observational studies (case reports, case series, case control studies and cohort) are somewhat limited. 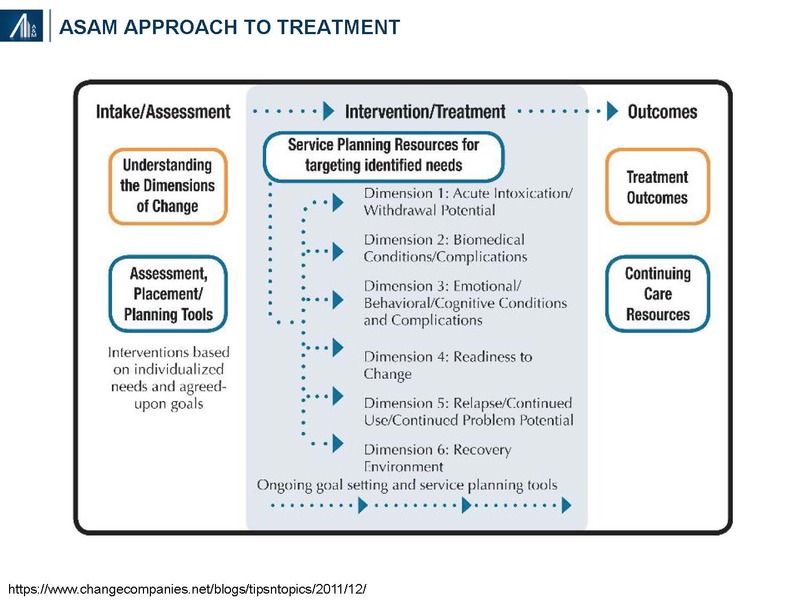 The American Society of Addiction Medicine (ASAM) “structures multidimensional assessment around six dimensions to provide a common language of holistic, bio-psychosocial assessment and treatment across addiction treatment, physical health, and mental health services, which addresses as well the spiritual issues relevant in recovery”. 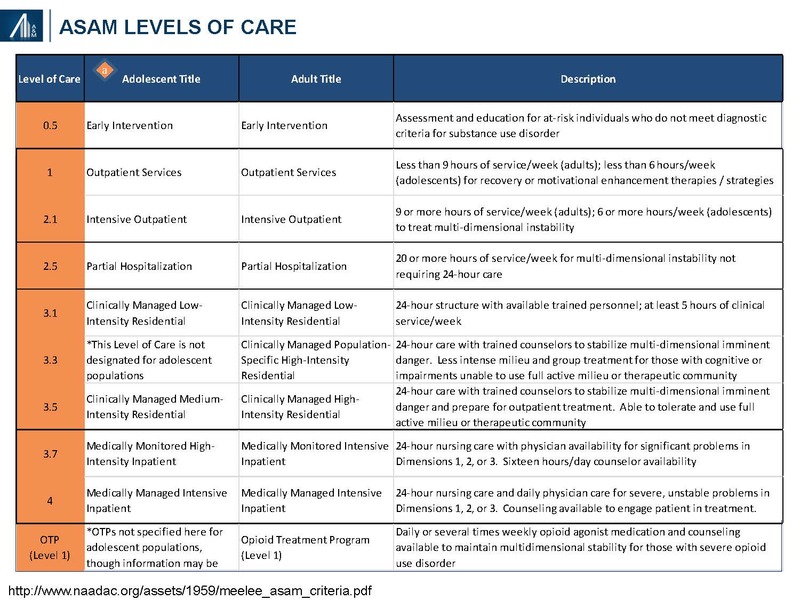 ASAM has also identified four levels of service based on daily requirements for physician care, nursing care, counseling and other services; and the ability of the patient to use a full active milieu or therapeutic community. Sites of care may include inpatient hospitals, residential services, “safe houses” and outpatient centers. Third-party insurers cover the cost of residential treatment, including the related “room and board”, only when deemed “medically necessary” (typically 2–4 weeks). Patients potentially benefiting from longer stays at the treatment facility may choose to personally cover the “room and board” cost of staying on campus in non-medical housing. Detoxification, a medically supervised program to manage the acute physical symptoms of withdrawal associated with stopping drug use, may occur in a hospital or residential center. Detoxification may include cravings, mood and sleep disturbances, flu-like and other symptoms (e.g., pain, tremors), confusion, seizures and hallucinations. The severity of withdrawal reflects the type and amount of drugs and / or alcohol, duration of abuse and presence of mental and physical co-morbidities.38 Methamphetamine and crack cocaine addicts do not require detoxification. Many different types of therapy, as well as service offerings—transitional, ancillary and other disorders—are used in the treatment of substance abuse and dependency disorders. 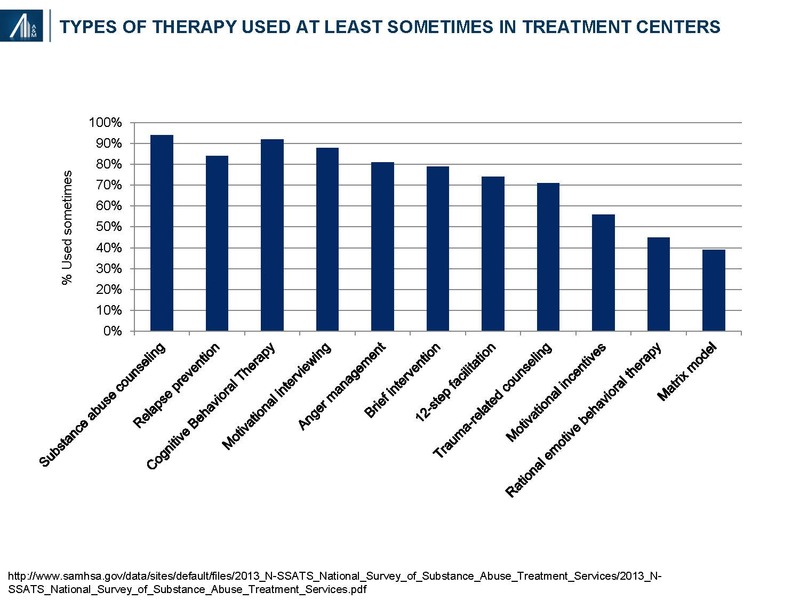 Nearly all treatment centers offer substance abuse counseling, relapse prevention, cognitive behavioral therapy, motivational interviewing techniques and other behavioral approaches. A description of each form of therapy is provided in the Appendix of the article. Detailed and standardized evidence-based guidelines for addiction treatment have not been developed due to the variability in patient need; i.e., drugs of abuse, co-morbidities, psychosocial factors, etc. In addition, most treatment centers do not have longer-term longitudinal outcomes data. Data from Hazelden, a nationally recognized nonprofit addiction organization founded in 1949, suggests more favorable outcomes from alcohol abuse (95%) at one year post-discharge relative to illicit drug use (50%). The Hazelden results may not be generalizable to other treatment centers due to patient selection bias and difference in treatment approach. The substance abuse market is bifurcated into two segments: commercial and out-of-pocket (29%), and Medicaid, the majority of the remainder. The commercial segment is unlike any other in healthcare, with high out-of-pocket expenditures of 30–100% depending upon the arrangement. For plastic surgery, 100% out-of-pocket is considered a discretionary expenditure, whereas SUD is potentially an acute emergency that potentially can lead to accidental death due to overdose. 1. Network status. Is the residential treatment center (RTC) in-network or out-of-network? Many privately funded, for-profit RTCs’ are out-of-network. The traditional in-network payment is negotiated by the insurance company and represents a percentage of charges; i.e., allowable. The insurance company then pays 80% of the allowable (after the individual deductible is met), whereas the client pays the remaining 20%. The out-of-network model is far different. RTC’s essentially charge “whatever” and then assume an allowance for doubtful accounts. The insurance company may pay a percentage of the charge, typically 40–60% but can be less, with the client accountable for the remainder. Essentially, the client is paying an “out-of-network” penalty based on the insurance company payment policy. Families are often desperate and often assume the liability. Out-of-network costs are an economic burden for the vast majority of Americans. 2. Payer mix, service coverage and payment methodology. Among the services provided include detoxification, residential services, partial hospitalization (>20 hours per week in residential setting) and outpatient services. Insurance companies tend to cover detoxification services, assuming medical necessity for <5 days, residential services for 7–28 days and many (but not all) of the services provided as partial hospitalization and outpatient services. 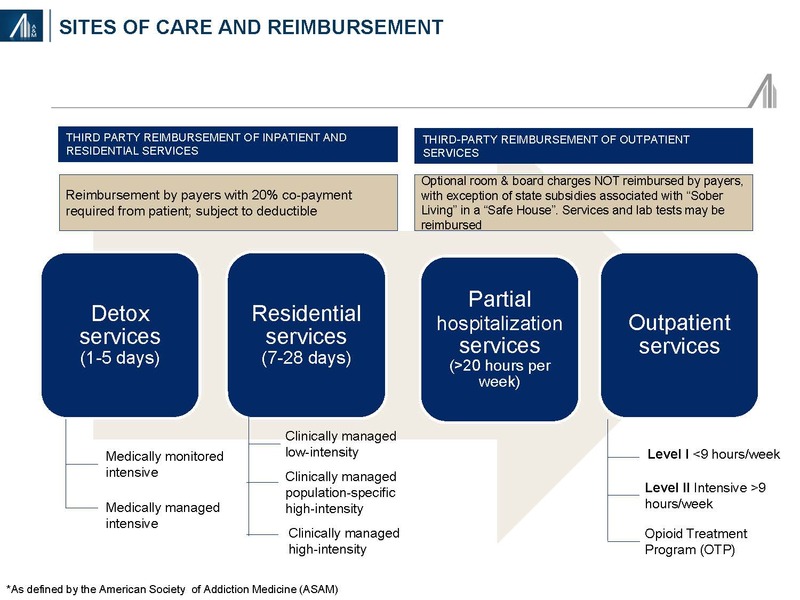 Until recently, most insurance companies covered inpatient stays of 28–60 days, excluding room and board charges associated with partial hospitalization and / or outpatient services in a “safe house” (“sober living”), the latter often being the direct (out-of-pocket) payment responsibility of the client. Facilities are often reimbursed on a per diem basis rather than per service. Per Diem reimbursement varies dramatically by a factor of 2–4x. BCBS is typically at the lower end of per diem reimbursement, with national carriers not exhibiting a consistent trend. Residential reimbursement can vary from $600 to $2,000+ per day, partial hospitalization from $500 to $1,500+ per day and intensive outpatient therapy from $400 to $1,000 per day. Alternatively, reimbursement could be provided for a bundle of assumed services or on a service-by-service basis. 3. Many Blue Cross organizations reimburse members directly for out-of-network services. Blue Cross will often reimburse their members directly for out-of-network services, assuming that the member will apply this payment toward the total charge for which he / she is liable. While this practice has historically occurred for smaller ticket items such as physician visits and the occasional ambulatory surgery visit, longer term SUD treatment can result in bills totaling tens of thousands of dollars. Direct payments to recovering addicts by insurance carriers, inclusive of payments owed to SUD facilities, has the unintended consequence of potentially undermining the intended benefit of treatment; transfer of insurance payments to providers may also not occur. 4. Self-pay is disproportionately high relative to other chronic conditions. Clients and / or their families often sign contracts regarding outstanding balances—the latter dependent upon network status and payment methodology. An inverse correlation exists between third-party commercial payments and out-of-pocket payments. 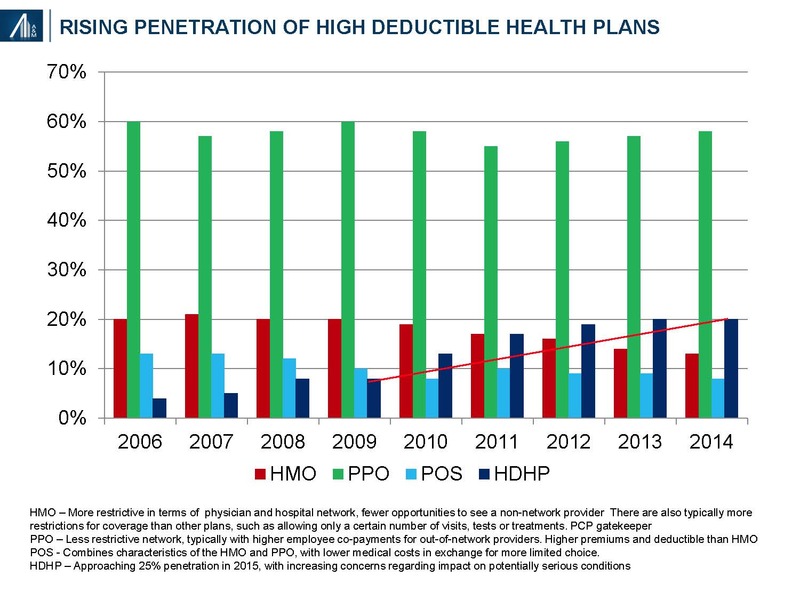 The growth of high deductible plans and increased cost-shifting among HMO / PPO plans further raises self-pay costs; penetration reached 24% in 2015.40 Private loans may be offered to the uninsured and individuals with limited coverage. The high rate of recidivism may result in multiple episodes of residential stays within any given year. 5. Continuum of services. Average length of stay (LOS) and average net daily revenue (ANDR) are important performance measures. The average LOS reflects the range of offered services, from detoxification to residential, partial hospitalization and outpatient services whereas the ANDR reflects the mix of payments for services, net of allowances. 6. Admissions. Publicly-traded companies such as Acadia Healthcare (Ticker: ACHC) and American Addiction Centers (Ticker: AAC) have grown via acquisition. Opportunities for leverage of sales and marketing, information technology, revenue cycle (collections) and corporate overhead exist. 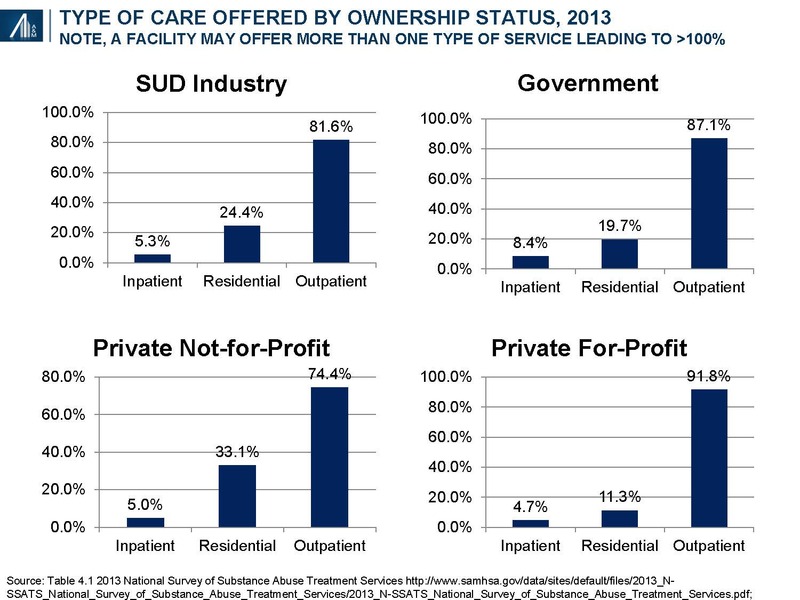 The overall utilization rate for for-profit designated beds is 96.8%. Performance measures include client admissions and average daily census. 7. Regulatory compliance. Fraud has been reported among a few operators of SUD services. Typical allegations include a failure to collect the full deductible or required co-payments; and the provision of unnecessary services. Diagnostic testing represents a key component for some, but not all SUD facilities. Excessive testing of SUD clients has been reported. Specific testing protocols have been developed for screening and confirmatory tests, the frequency of testing and the number of tests in a specific panel. 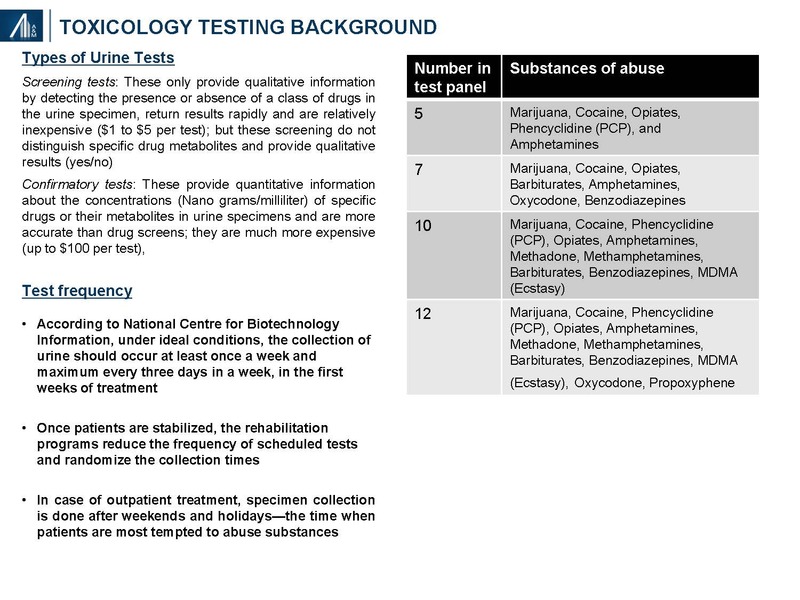 Testing is usually done at the class level (e.g., opiate), and not substrate (i.e., types of opiates such as hydromorphone, oxymorphone, dihydrocodiene, methadone, fentanyl, etc.). The University of Colorado and others have developed test panels capable of identifying over 100 different substrates from a single sample. Samples may be tested in-house, and at in-network and out-of-network labs. 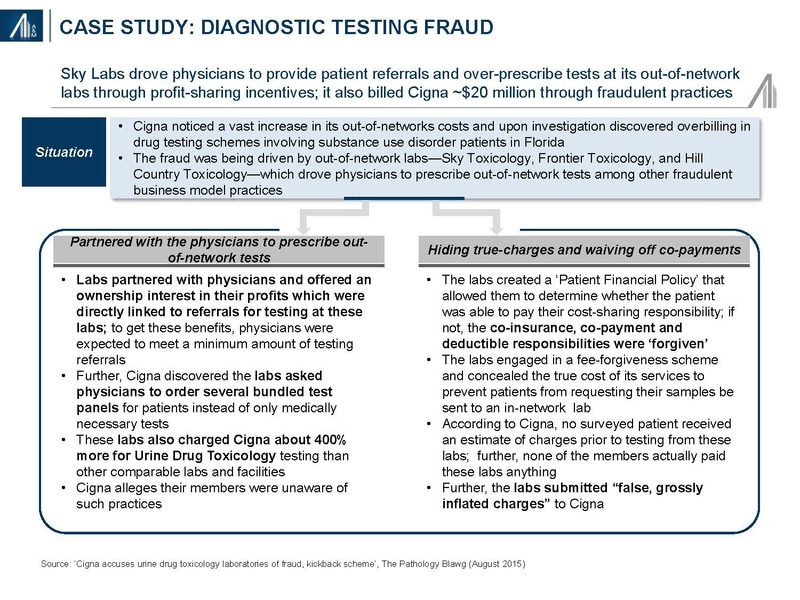 Fraud has been reported in the SUD diagnostic testing segment resulting in increased payer scrutiny and changes in carrier and employer coverage policies. Among the allegation include physician and patient kickbacks, the performance of tests that were not necessary or medically appropriate, upcoding (i.e., billing for a higher-priced treatment than was actually provided) and unbundling (e.g., billing for individual tests comprising a panel menu). Our recommendations will vary somewhat based on whether an entity is currently utilizing a predominantly out-of-network or out-of-pocket revenue model. We believe the inordinately high operating margins are unlikely to be sustainable in the not-too-distant future due to increasing payer scrutiny and changes in policies, including the formation of narrow networks of treatment centers. Ongoing carrier consolidation is likely to accelerate the policy standardization process, and perhaps with increased market clout, lead to unilaterally imposed payment policies. The diagnostic testing market is already undergoing significant price pressures. Operators will increasingly need to consider short-term practices within the context of longer-term industry trends; i.e., generate a 3–5 year strategic plan. Opportunities to utilize in-network commercial models, enhance end-to-end revenue cycle management capabilities, invest in infrastructure (coding, compliance and clinical documentation) and add clinically-oriented case management capabilities (to better interface with payers) require consideration. The need for professional managerial talent familiar with healthcare policies and procedures, combined with other investment requirements, highlight the potential for competitive advantage associated with scale. Robust capabilities and infrastructure in pricing optimization, managed care contracting, regulatory compliance and care transition management (from remote residential to community of origin outpatient) will become increasingly important. The total “price of recovery” includes the cost of ancillary services, inclusive of diagnostics. Despite the industry risks, opportunities exist to provide a more evidence-based, cost-effective and in-network treatment regimen. The unmet need continues to grow. David Gruber MD, MBA is a Managing Director and Director of Research with the Alvarez & Marsal (A&M) Healthcare Industry Group in New York, specializing in strategy, business development, commercial due diligence, analytics and health benefits. He has more than thirty-two years of diversified healthcare experience as a corporate executive, Wall Street analyst and consultant. Steven Boyd, Managing Director is a Managing Director with Alvarez & Marsal’s Healthcare Industry Group with more than fifteen years of financial and operating experience serving private equity owned healthcare companies. Mr. Boyd has deep operating experience in several segments of healthcare including toxicology laboratories, medical devices & diagnostics, physical therapy, dental service organizations, urgent care, and specialty physician practice management organizations. 2 Coffey S., Volberding P. HIV InSite Knowledge Base. University of California, San Francisco. http://hivinsite.ucsf.edu/InSite?page=kb-01-03. 3 Health, United States, 2015: With Special Feature on Racial and Ethnic Health Disparities. National Center for Health Statistics. Hyattsville, MD. 2016. https://www.cdc.gov/nchs/data/hus/hus15.pdf#019. 9 Overdose Death Rates. 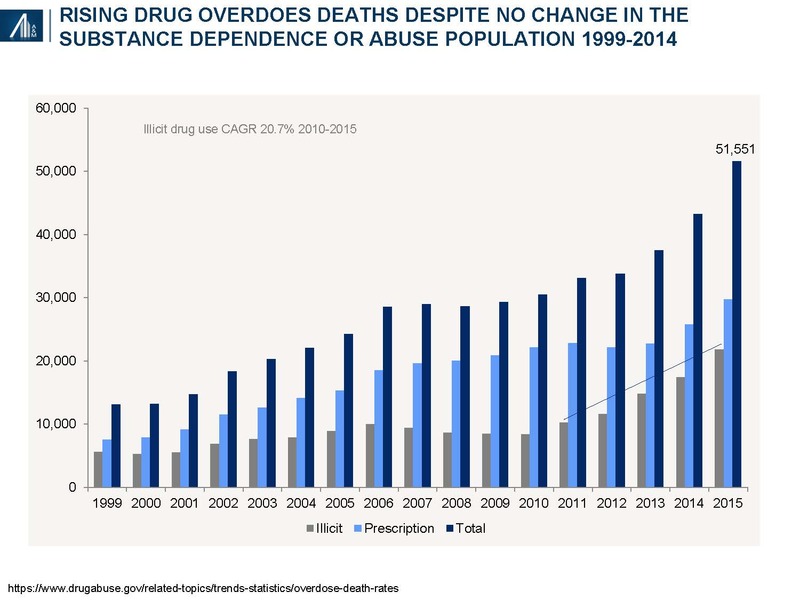 National Institute on Drug Abuse (NIDA), January 2017. https://www.drugabuse.gov/related-topics/trends-statistics/overdose-death-rates. 21 H.R. 1628, American Health Care Act of 2018. Congressional Budget Office; May 24, 2017. https://www.cbo.gov/publication/52752. 23National Drug Intelligence Center (2011). The Economic Impact of Illicit Drug Use on American Society. Washington D.C.: United States Department of Justice. http://www.justice.gov/archive/ndic/pubs44/44731/44731p.pdf. 26SAMSHA; Bureau of Labor Statistics http://www.tradingeconomics.com/united-states/labor-force-participation-rate. 31Prescription Nation 2016: Addressing Americas Drug Epidemic. 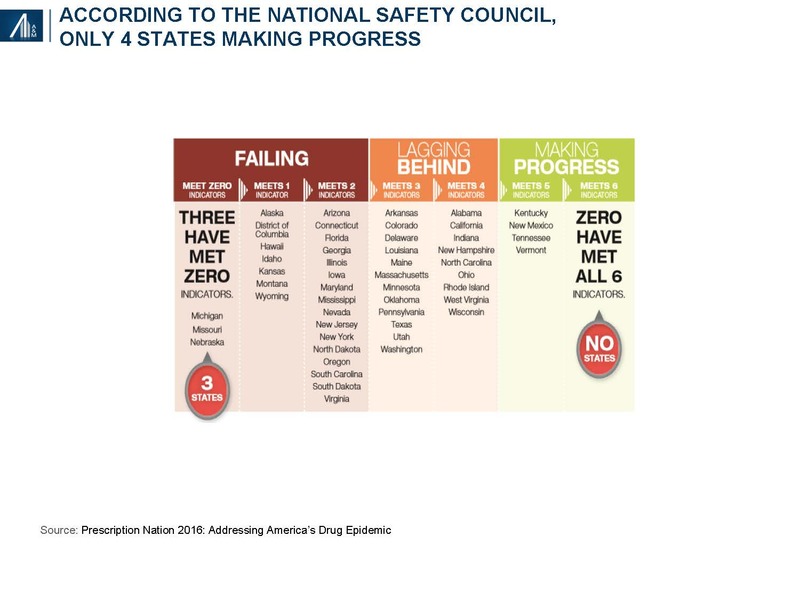 National Safety Council, 2016. 32Bloomberg School of Public Health. Science Daily, June 2, 2016 https://www.sciencedaily.com/releases/2016/06/160602083239.htm]. 34Projections of National Expenditures for Mental and Substance Abuse Services, 2010–2020, SAMHSA. 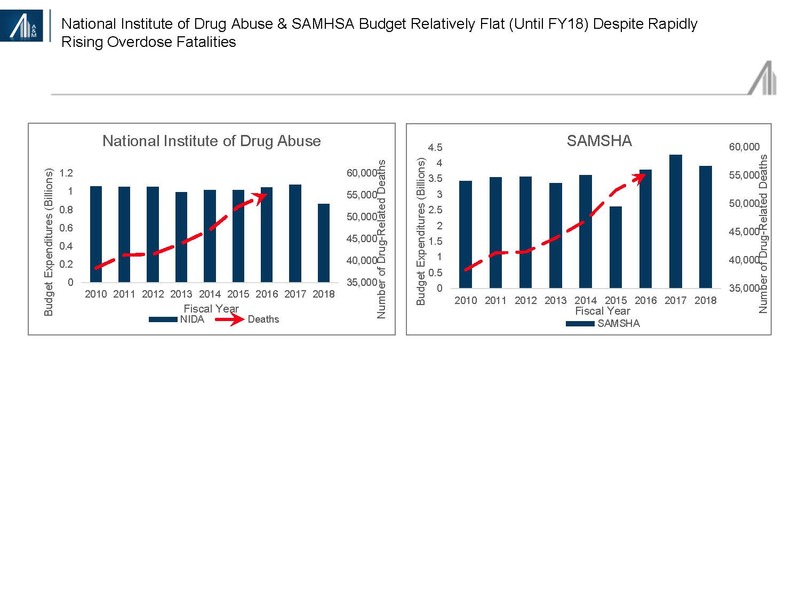 36Table 4.4 Facility size in terms of number of clients, by facility operations; National Survey of Substance Abuse Treatment Services, 2013 http://www.samhsa.gov/data/sites/default/files/2013_N-SSATS_National_Survey_of_Substance_Abuse_Treatment_Services/2013_N-SSATS_National_Survey_of_Substance_Abuse_Treatment_Services.pdf. 38 Gifford, Maria. Private Drug Detox and Withdrawal Programs. http://luxury.rehabs.com/drug-detox/#withdrawal; http://www.webmd.com/mental-health/addiction/alcohol-withdrawal-symptoms-treatments. 41Ferguson, Cat. Addicts for Sale. BuzzFeed News, March 19, 2016. http://www.buzzfeed.com/catferguson/addiction-marketplace.